The architect Paolo Caliari? Someone predestined perhaps, at least to go by his name which is the same as that of the 16th century painter and architect who was better known as Il Veronese. Certainly for most people our man - not from Verona but "Zena" (Genoa in local dialect) - is less famous than his ancient and illustrious namesake, but in the world of boats, and for about forty years around these parts, the signature of architect Caliari has definitely left its mark. 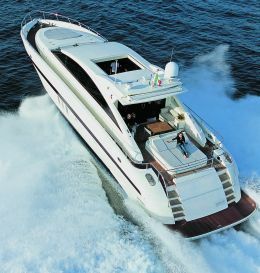 From his first boat, the famous GA 30, a 1964 Baglietto custom built for Gianni Agnelli on which he worked with the architect Albertini, right down to his most recent designs, Caliari's boats have often hit the target, offering owners a design of maximum rationality in which the use of essential forms was to become almost a sort of highly personal trademark. It would be hard to confuse his boats with the rest available on the market. One of his latest creations is this Jaguar 24 Sport, an open motoryacht that represents the debut of a shipyard set up only recently, F.P. Yachts. Based in Marina di Carrara, its managing director is Fabrizio Santucci and its chairman Filippo Picchiotti, another name closely linked with the history of Italian yachting. Perfectly reflecting the essence of the open motoryacht concept, the boat is a shooter, very sporty, with few lines delineating a thrusting form, especially at the bow, and with a more rounded stern and a curved hard top which Caliari has created by containing its height, integrated and cohesive with the stern sections design which features a windshield that seems to run uninterrupted aft and has the merit of considerably reducing perceptibility of the superstructure, especially in side view. The transom is "cut" by two access stairways to the swim platform which also delimit the sizing of a central volume and a spacious tender garage above which there is a fairly large sundeck. Farther forward this terminates in a living area that serves the open air dining space, in the cockpit, where there are two sofas. For sun-lovers there is a second area forward, set into the deckhouse and easily reachable by suitable gangways. Access to the interior is also optimal, with a fully opening door into the saloon. We wish to point out that though this is a boat in GRP it is nonetheless a custom model that may be personalised. 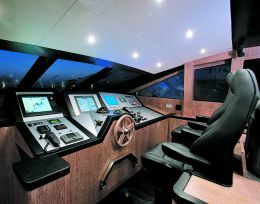 On the strictly technical side, for example, with choice of engines or type of transmission (the boat is driven by surface piercing props) and also with regard to interior layout, furnishings, woods and materials to be used etc.. So the description that follows - the design in the case of this model was done by the Tassin studio - is specific to the boat we saw and may be considered modifiable. 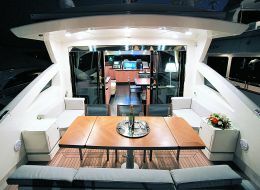 There are two areas in the saloon: along the port side there is a bar and then the living area while the internal dining area is on the starboard side with a spacious C-shaped dinette. Farther forward and centrally situated are the helmsman and co-helmsman's chairs, high and enveloping, then the richly technological command station, homogeneous with the refined but at the same time sporty style of the decor. The latter is fairly trendy with dark wood - wenge in this case - for the flooring, contrasting with the light shades of the furniture and ceilings in sandblasted teak. On the subject of ceilings, the Jaguar 24 Sport is equipped with an open-up hard top so the saloon below may be transformed into an area to be perfectly enjoyed "en plain air". Below deck absolute privacy is ensured by complete separation of the crew's night zone aft and that of the owner/guests forward, each with its separate access stairs. 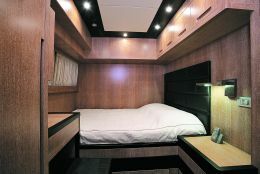 The owner's large cabin is amidships, running the whole width of the hull, and receives plenty of light from the vertical windows. There is a dressing room and a spacious bathroom, the whole decorated in harmony with the saloon in a continual play of light and dark shades. The same goes for the three guest cabins, one with a queen-size bed set against the bulwark, one with twin beds and one VIP, all with private bathroom. 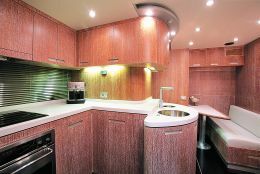 For the crew there is one three-bed cabin with bathroom, and next to it a well equipped galley, again in sandblasted teak. As for the technical aspect, the boat has a V-keel with deadrise of 16° and is driven by surface piercing propellers which, as we have said, may be either SDS or Arneson. The Jaguar 24 owner can choose between two powers and two makes of engine: 2 x 1.500 HP MAN or MTU, or 2 x 2.000 HP MTU. Consequently there are also two speed targets the boat can achieve which, as the yard states, exceed 40 knots or 47 with the "mean" version.